After playing Assassins Creed on my PC using the keyboard and mouse and absolutely hating the controls, I decided to start doing some research on a usb gamepad for my system. I was pretty much set on getting Microsofts Xbox360 wireless controller with the usb dongle, but I really didn’t want to spend over 40 bucks on something I wasn’t really going to use that often. I did a little looking around on ebay and came across a disgustingly cheap sony dual shock knock off. 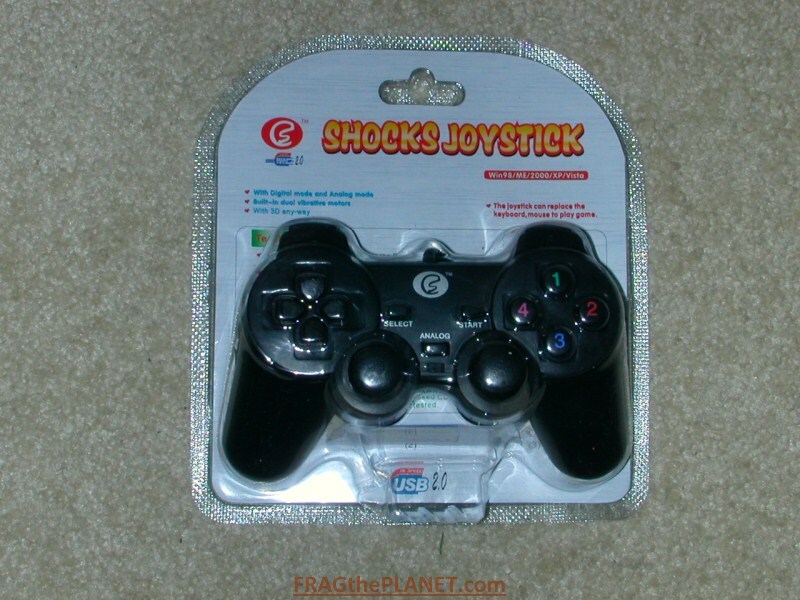 After sifting through a few different brands I settled on the Shocks Joystick made by some chinese company, ShenZhen something something. For 9 dollars shipped I figured what the heck I’d try it out. Ordered it on friday and got it on monday. The packaging was ok, it was easy to get into no cutting involved. The controller itself seems decent, all the buttons are nice and clicky, the dual joysticks move and reset themselves correctly. The driver install was real tricky, I could not for the life of me to figure out what driver I needed on the cd they supplied. I spent about two hours trying to get the right drivers installed, trying ones I found on the web, and no luck. Windows 7 would only recognize one of the dual joysticks. I just about decided to give up and decided to uninstall all the seventeen drivers I installed, and after all that it started working. So here is my advice if you get one of these gamepads see if windows will correctly identify it first before installing the wacked out manufacterers drivers. All in all I am happily playing Assassins Creed on my PC and it cost me a whole 9 dollars, how great is that. i got the same thing just without the white logo.packaging is a bit diff, but the gamepad is exactly the sameit has no name at all but came with a mini cd with about 4 drivers. Try just using the driver that windows installs, then clicking the analog button on and off on the gamepad enables the dual thumbsticks. I am running windows 7, have the same gamepad but no driver for it. where could i get the driver or could someone email it to me please. I actually only ever used the driver already installed in windows 7. Does it show up as a gamepad in your device manager? i need driver of pu 850 . can i use any alternative driver? I’ve had this gamepad for 9 months now and it’s works like a charm. The cord is super still though. Mine has been working fine ever since I wrote this article… I’m sure that being a cheap chinese made controller there would be quite a few that have problems.